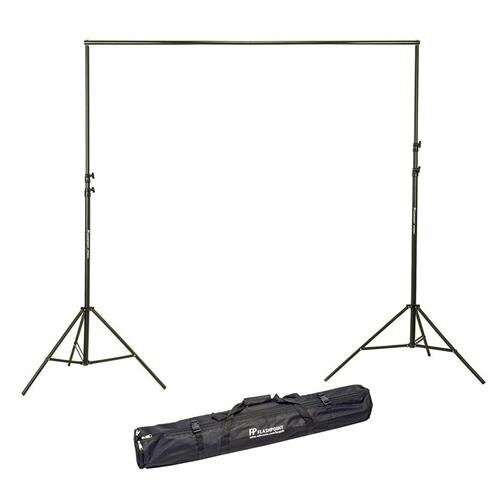 The Flashpoint 10' Background Support System is a transportable kit to support heavy seamless paper up to 96" in width, as well as lighter fabric and muslin backdrops. Two specially designed heavy-duty professional 10' support stands with locking knobs and tubular legs act as the pillars for a 3 section crossbar accommodating a range of standard seamless papers. The 3 sections interlock witha tension spread wedge controlled with a hex key. The kit is well suited for location work. The whole set fits neatly in a heavy-duty canvas carry bag with aindividual section for each component. The weight limit across the extended length of the crossbar should not exceed 30 lb. It is best to secure the stands with weight bags to insure safety on the set. Strong transportable support for paper, or fabric backgrounds.